GECA speaks to Bec van Reesema from cleaning service providers Zippy Cleaning and Maintenance Services about what certification means to them. What sets you apart from other cleaning service providers? 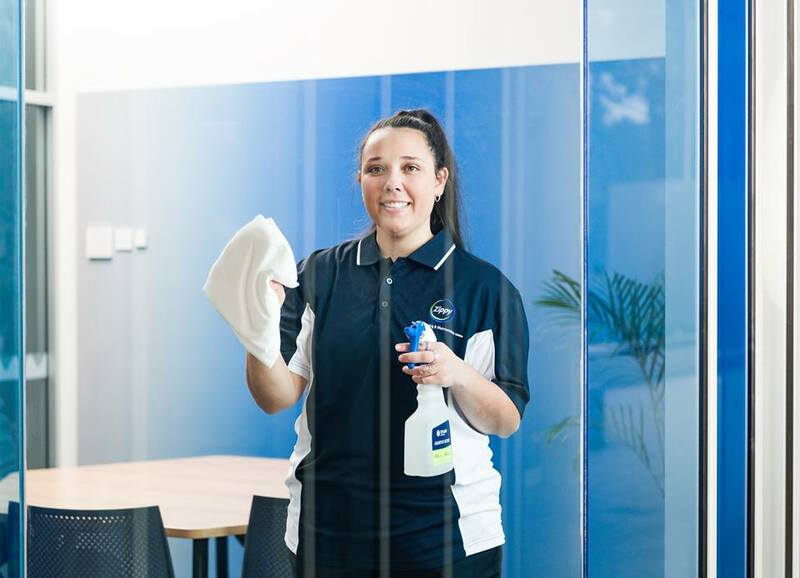 We are the leading cleaning service provider in South Australia and the Northern Territory to offer a completely chemical-free cleaning solution through the Tersano Lotus Pro Stabilised Aqueous Ozone System (which is also GECA certified). Currently, we are the only cleaning services company in Australia that has GECA certification. We employ all our cleaning staff directly and also take care to choose local businesses as suppliers wherever possible to ensure that all profits from our purchases go back into the state’s economy. It makes us accountable for our resource consumption as well as the types of products and services we choose to offer. We chose it to assure our existing and potential customers that the services we provide, and the products that we use to deliver them, are safe and healthy for all property occupants and contribute towards reducing our overall impact on the environment. We also wanted to improve our eligibility for Green Star and NABERS accredited sites, and to potentially assist our existing customers to achieve accreditation. Our corporate responsibility includes the health of staff and customers as well as protection of the environment and the reduction of our environmental footprint. Our certification proves our credibility and our commitment to environmental sustainability to our customers, potential customers and competitors. We feel that we have an ethical obligation to provide safe and environmentally conscious products and services to our customers, and we see GECA as the right organisation to ensure that we are consistently aligned with this obligation. What’s changed for you as a result of either going through the certification process or since achieving GECA certification? The certification process forced us to closely evaluate our company’s environmental processes and make changes and updates where required. For example, we had to review the supply chain for one of our garbage bag products, which involved us going all the way back to its place of manufacture in Malaysia to make sure that the product was GECA compliant. Certification has also forced us to closely scrutinise our products and suppliers so that we are confident that we can say we are using the best and most sustainable products available. For example, we were approached about the Chemform Sapphire chemical dispensing system and our GECA certification forced us to evaluate the product more deeply. That product is now used on two of our biggest and most challenging sites. We are now even more aligned with our community values. Whenever we source new products and services, we now have the guidelines to ensure that we find the best and most sustainable options possible. And finally, our GECA certification has opened up opportunities for new business relationships with other GECA certified suppliers, as well as plenty of opportunities for advertising our business. Chemical use and disposal; inefficient use of resources such as electricity and water; difficulty obtaining feedback from cleaning staff; and customer resistance and reluctance to change mindsets, particularly when it comes to the perception that “green cleaning” or chemical-free cleaning is expensive or the customer’s own limited knowledge of relevant environmental information.